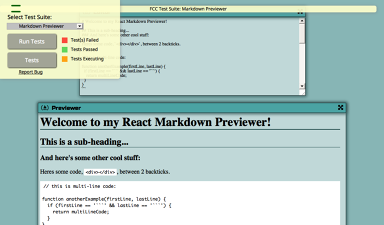 MarkDown Previewer: Is it too similar? Visually, I would say no - most of the markdown projects (and some others) end up looking very similar to the example cause that’s what everyone is looking at to build their projects - Looking at some of the code, there’s some small things that look possibly copy/pasted, not enough that I would be concerned - but I would try to avoid that in the future. If it were me, I would turn it in and move on to the next one, I think you’re fine. Thanks. I’ll let this post linger for a few days to see if any admins say they’ll flag my account for academic dishonesty if I turn it in. I’ll try to extract the editor element in another fork. User story #4 is too dependent on the Marked library to not use it. Off the top of my head, not using it would entail a massive switch of regular expressions and a full understanding of “GitHub flavored markdown”. I was taught years ago to not reinvent the wheel when coding.